Length: 0 Hours 56 Mins. DG has already issued two solo CDs by the young (b.1987) pianist Yuja Wang; the first received a mostly positive review by Peter J. Rabinowitz in Fanfare 33:1, the second an enthusiastic recommendation by Colin Clarke in 34:1. This new CD is her first concerto recording. The two qualities that stand out in Wang's playing here are, first, the stunning fingerwork, which is flawlessly accurate and clean throughout, and second, the maturity of the music-making. Rachmaninoff's two best-loved works for piano and orchestra have often been used as vehicles for virtuosos, but in these performances there are no exaggerations, no distortions, no self-indulgent histrionics; rather, there is the give-and-take between soloist and orchestra, along with the large-scale shaping of the music, or “sense of narrative direction,” that Rabinowitz sometimes found lacking in Wang's sonata recordings. This is particularly true of the concerto. The main tempo of the first movement is fairly fleet and the balance between piano and orchestra in the opening theme ideal, with no unnatural spotlighting of the soloist (the recording does make the orchestra sound bigger than a chamber orchestra, but that's probably an advantage); not until the second theme does the piano really sing. Wang and Abbado allow the tempo to surge forward at the climax of the movement—the passage leading up to the recapitulation—but this makes perfect dramatic sense. Analogously, the reprise in the second movement sounds like a returning home: There's the sense both of being someplace familiar and of arriving there after having been on a journey. In the finale we're not so aware of Rachmaninoff's many varying tempo markings as we are of the overall progress to the triumphant conclusion; Wang phrases her first statement of the “big tune” simply, leaving the music with somewhere to go. Reminding me most of the celebrated Cliburn-Reiner version, but also influenced by the composer's own no-nonsense approach, it's altogether a very satisfying account that also happens to feature some awfully impressive pianism. The Paganini Rhapsody is given a somewhat more generic reading, but a commanding one nonetheless. Again Wang is technically flawless, and the large formal arches connecting the many brief variations are shaped naturally and effortlessly. Wang's phrasing and voicing in the touchstone 18th variation are expressive but never arbitrary, and her articulations in the scherzo-like variations that follow uncanny. (I had never before noticed the direction quasi pizzicato in the piano part.) The end is not as tongue-in-cheek as it might be, but this is a quibble. This is altogether a most impressive and enjoyable disc. 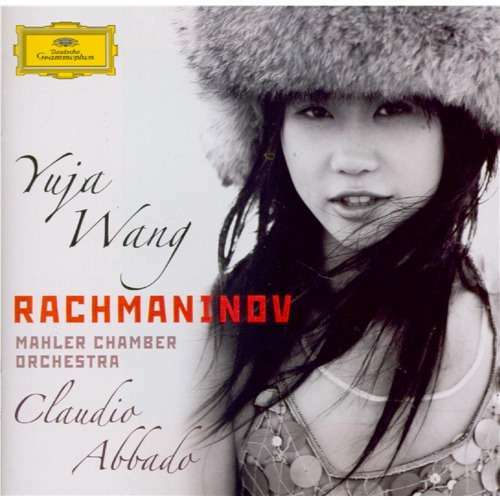 Yuja Wang is a supremely talented and uncommonly mature young pianist, and surely has a huge career ahead of her. First-class! With the vast plenitude of recordings of Sergey Rachmaninov's Rhapsody on a Theme of Paganini and the Piano Concerto No. 2 in C minor, one has to wonder why Yuja Wang and Claudio Abbado chose these blockbusters for her first album with an orchestra. There are many possible reasons, including the composer's instant name recognition, the performers' preference for the music, and the obvious potential for Wang's career advancement. But the most apparent one is that the Mahler Chamber Orchestra is the right ensemble to accompany her in these pieces, and the combination is surprisingly good. In the concerto, Wang's delicate and refined playing might have been obscured by Rachmaninov's thick mid-range scoring, and a large orchestra would have made recording her extremely difficult, if not utterly pointless. But Wang is perfectly audible with scaled-down forces, so the concerto works brilliantly in this case. The Rhapsody is a more skillfully wrought composition, and it offers more transparent orchestral writing. Here, Wang's performance with the orchestra almost has the intimate feeling and clarity of chamber music, and everything sounds fantastic. Abbado certainly knows how to balance the sound of the orchestra to complement Wang, and the partnership between conductor and soloist works well to show the music to best advantage. For listeners who have found Rachmaninov's music to be a bit opaque, this CD is worth hearing, especially for the open textures of the Rhapsody. In den USA bereits ein junger Star, steht die Entdeckung Yuja Wangs, eines der faszinierendsten Klaviertalente seit langem, einer größeren Öffentlichkeit hier noch bevor. Nach zwei eindrucksvollen Soloalben, präsentiert die junge Pianistin nun ihr erstes Album mit Repertoire für Klavier und Orchester - und zwar mit den beiden populärsten Werken von Rachmaninow, live aufgenommen mit dem Mahler Chamber Orchestra unter der Leitung von Claudio Abbado! R. s berühmtes Klavierkonzert Nr. 2 gilt als eines der grundlegenden Werke der Spätromantik und seine Rhapsodie über ein Thema von Paganini op. 43 als jenes Werk, das in seiner magischen Variation 18 eine der schönsten, schwärmerischsten Melodien der gesamten Klavierliteratur beinhaltet. "Mein Lieblingsstück von R. für Klavier und Orchester: [Es ist] ein leidenschaftliches Werk, das gut zu jungen Leuten in meinem Alter passt, weil es so emotional ist. Es ist wie Rock'n Roll in klassischer Musik." Nach ihren zwei Soloalben hat die chinesische Pianistin Yuja Wang eines der berühmtesten romantischen Orchesterwerke eingespielt: Das 2. Klavierkonzert von Rachmaninoff, live unter der Leitung des legendären Maestros Abbado! Ein wunderbares Hörvergnügen! Yuja Wang hat sich stark von Rachmaninoffs eigener Interpretation dieses Konzerts inspirieren lassen, die so kontrolliert und klassisch zurückhaltend ist, wie sich andere extrovertiert und leidenschaftlich zeigen. »Dort, wo man vielleicht große Gefühle erwartet, wird sein Klang nicht voller, sondern bleibt im Gegenteil erstaunlich transparent«, erklärt die Pianistin. Audio 06 / 11: "Das hochtalentierte Protege dieses Erfahrenen zeigt in der hier vorgelegten populären Werkkoppelung der beiden Orchesterwerke Rachmaninoffs, was ihr bei Schubert abging - die organische Entwicklung von einzelnen Phrasen zu Höhepunkten. Ihre hervorragenden Spielreflexe könnte sie etwa zu innigem, gesangvollem Legato weiterbilden und damit die Intensität ihrer Könnerschaft steigern." FonoForum 06 / 11: "Nach zwei erfolgreichen Solo-CDs brilliert Yuja Wang nun in ihrer ersten Orchestereinspielung. Die junge Chinesin verwandelt diese Schlachtrösser der Konzertliteratur zu elegant dahingaloppierenden Hengsten. Yuja Wangs stromlinienförmigem Spiel, das unglaublich virtuos und geschmackvoll ist, passt sich Claudio Abbados weich flutendendes Orchester ideal an."